I have been poking around on Ring Lord and the Library. I am a newbie and I find that (not just Ring Lord tutorials) most people offering tutorials, purchased or free, do not list the rings as AWG or SWG. It’s confusing the hell outta me. I get what the AWG and SWG mean, but what I don’t get is why people usually don’t put it in their tutorials. Am I wrong in assuming it DOES make a difference? That said, since I buy my rings from Ring Lord and they are all SWG, are all tutorials on The Ring Lord site using SWG rings?? I would never use either of those. I measure My wire in mm fractions. I would never use a tutorial which only say x gauge, since that gives me no relevant information. TRL sell Both AWG and SWG, don’t they? For most weaves, if not all, the relevant ring size is the ratio between its diameter and its thickness (wire diameter), called the Aspect Ratio. That way, you can easily scale up and down the weave. For example, a weave should look the same with 4mm ID / 1mm WD (AR 4) and with 1/4in ID / 16SWG WD (6.35mm / 1.6mm = AR 4), only bigger. Most ring suppliers show the AR in their listings, including The Ring Lord. Mind that The Ring Lord uses SWG for "large" wires, but AWG for finer wire. I've noticed the same thing, and so I generally have to ask -- unless the company also provides the wire diameter information, at which point I know what I need to know. Well said J, well said. It is an important consideration, the sizing of the metal can have dire implications in relation to the flexibility, accessibility and potential to "lock up" of many weaves. I.D. and E.D. is useful but wire girth, a road less traveled I fear. Admittedly, mainly when talking squares vs rounds. (I do like my high tolerance weaves). TRL stocks 18and thinner awg ,16 and thicker swg. Idk about 17. Im sure there are still many gauge system discrepancies on this site not for lack of editing initiatives,,. 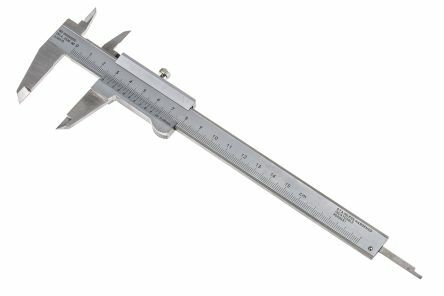 I feel like you are going to hit roadblocks if you expect consistency in the caliber of info, do your own experimenting before commiting to anything too involved..
All hail Lord Caliper binder of the Vernier scale!